Digital x-rays provide our team with the ability to view images immediately. To better serve you, we have recently converted from traditional plain film x-rays to digital x-rays. Traditional x-rays were time intensive and inefficient. Digital x-rays provide the ability to view images immediately, allowing the doctor to discern if different or additional views are necessary, with almost no wait time for the patient. The images are much clearer and more detailed allowing the patient to better view the subluxations or other conditions that may be causing their symptoms. In addition, digital x-rays also provide greater portability as the images can be burned to a disc providing better coordination of care between healthcare providers. 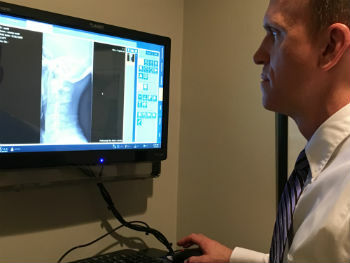 For new patients, if your doctor feels digital x-rays are necessary, they will be taken and viewed on site. Likewise, during your care, digital x-rays may be taken to help manage your condition. We’re proud to provide digital x-rays to our patients, when necessary. If you have any questions, please contact us and we’ll happy to help!